This will be our last and final post about John Barclay's book Paul and the Gift. Again, as I said in the first post, these posts are not attempting to be a full and scholarly review of Paul and the Gift. I'm simply using these posts to collect insights from Paul and the Gift that I found interesting, helpful or important. 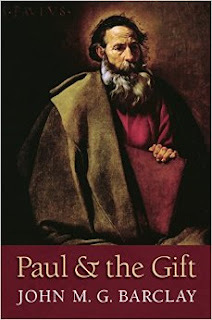 So reader be warned, Paul and the Gift is an academic tome of modern Pauline scholarship. Personally, I got a lot out of Paul and the Gift, but I like reading Pauline scholarship. But not everyone does. So let's wrap this series up with a final takeaway from Paul and the Gift. Recall Barclay's argument that grace can be "perfected" in one of six different ways (and I've suggested a seventh). Recall also that many of these perfections don't come from Paul but come, rather, from the debates of church history. Non-circularity was one of the perfections that emerged out of the Protestant break with Catholicism. Non-circularity is the perfection that for grace to be "perfect" it has to escape the cycle of reciprocity and repayment. As Protestants know, God's grace--as a perfect gift--cannot be repaid. To attempt repayment is foolish and impossible. And to even think that you could repay the gift is an act of sinful pride, the hubris of "works-based" righteousness. Grace, in the hands of Protestants, is non-circular. Repayment is impossible. But as Barclay points out, the perfection of non-circularity is foreign to ancient notions of gift-giving. And more than foreign, nonsensical. The gift-economy of ancient patronage assumed that gifts obligated recipients to make a repayment of some sort, if not materiality then in gratitude and loyalty. And as Barclay goes on to point out, Paul's treatment of grace adopts these ancient assumptions. Grace creates covenantal obligations. Grace expects gratitude, fidelity and righteousness. So where did the perfection of non-circularity come from? Simplifying greatly, non-circularity emerged out of the debates between Protestantism and Catholicism regarding the role of "merit" in salvation. In the debates about sola fida and sola gratia the notion of non-circularity was perfected, pushed to its logical and rhetorical extreme through the fires of debate. We've inherited this distortion--the perfection of non-circularity--which distances us from Paul's more ancient understanding that grace creates bonds of obligation, fidelity and reciprocity. There are many important implications about this development that I'd like to unpack in this post. First, the quality of gift-giving is always assessed against its ideal, "perfect" manifestation. For Christians, then, our gift-giving is always going to try to mirror God's gift-giving. So if God's gifts are perfect in being non-circular, according to Protestants, then our gifts are perfect insofar as they are also non-circular. That is to say, our gifts are "perfect" if they escape repayment. And I would argue that this notion--that our gifts are perfect in how they reflect the non-circularity of God's gifts--has been one of the most toxic and damaging ideas in all of Protestant theology and ecclesiology. If you've spent any time at all in Protestant churches you'll have noted one of our neurotic patterns: We're happy to serve but very, very uncomfortable being served. Protestants are very servant-hearted people. We'll work ourselves to death serving people. But you cannot serve a Protestant. To be on the receiving end of service makes us very, very uncomfortable. And the reason for this, following Barclay, is our inherited theology of grace, a view of gift-giving that perfected non-circularity. Service--and gift-gifting generally--cannot and must not ever be reciprocated. Because if it were to be reciprocated, in this theological scheme, then it is no longer a gift, no longer grace. According to the perfection of non-circularity, reciprocity contaminates the gift. Thus, we are very, very happy to serve, but that service must never be reciprocated. You see the sad outcome here, right? In the community of faith we are happy to give but can't ever receive. We are happy to serve but can't ever be served. Driven by the perfection of non-circularity the economy of love is sacrificed for charity. Charity is a one-way, non-circular gift, something I give to you that you must never, ever repay. Economy, by contrast, is circular, bonds of mutual sharing and obligation, gifts given back and forth, back and forth, back and forth. In sum, by perfecting non-circularity the Protestant theology of grace ruined our ability to form Christian community, a community rooted in covenantal bonds of mutual affection and shared obligation. Making matters even worse, the Protestant theology of non-circular grace perfectly suited the individualism of modernity. Non-circular grace--grace as charity--is a one-sided model of love that is perfectly suited to individualism. I, the benevolent giver, give a gift to you, the recipient. Just like God. You can see the toxic effects of this notion upon Christian community. But consider also the toxic effects upon Christian service and mission in the world. Because grace must be non-circular when we go into the world we are always placing ourselves in a god-like position: Here we are, as Christ's representatives, to serve you. You cannot do nothing for us. We want no repayment. And while that sentiment seems noble, you can see how problematic it is. Again, our imaginations about grace have been so distorted by the debates of church history that can't see how twisted our notions of grace have become. In our twisted imaginations it seems perfectly obvious that grace expects no repayment. And yet it is also perfectly obvious that when we go into the world on mission and service trips that this one-sided model of grace creates enormous problems: Here we are to serve you, and you shall do nothing for us. In fact, you can make a good argument that the colonialist, savior-complex that infects missionary and service efforts in the church is rooted in the Protestant theology of non-circular grace. Of course I'm not suggesting that we expect payment for the gifts we give. We can't let our notions of grace get captured by modern economies of capitalistic exchange, something far, far from the ancient imagination of gift. What is needed is a recovery of the ancient imagination that gifts connected people in bonds of mutuality. And of particular importance here is how, in the early Christian communities, these bonds of mutuality broke with the patronage of Greco-Roman culture. Again, in the ancient gift economy gifts created obligations, often suffocating and oppressive obligations, between the rich and poor, between the powerful and the weak. So while Paul assumed that gifts flowed through bonds of mutual obligation, Paul was keen to dismantle the hierarchical nature of ancient patronage and gift-giving. This is the big battle Paul is fighting in the book of 1 Corinthians, where the hierarchy of Roman patronage was leaking into the church. God has put the body together, giving greater honor to the parts that lacked it, so that there should be no division in the body, but that its parts should have equal concern for each other. If one part suffers, every part suffers with it; if one part is honored, every part rejoices with it. In the church we practice what I've called rehabilitative honoring, giving greater honor to those who have been shamed by the world (i.e, "giving greater honor to the parts that lacked it"). And what is key here, to return to the point above, is mutuality, that the parts of the body "have equal concern for each other." In the body we are covenantally connected. If one part suffers, we all suffer. And it's that interconnectedness, the entire motif of Paul's body metaphor, that is cut off by the non-circular Protestant theology of grace. We could put the matter this way. When it perfected the notion of non-circularity the Protestant theology of grace lost its covenantal imagination. Which is a point that helps connect us back to the last post. Recall that Paul's gospel of incongruous grace nullified ("crucified") systems of honor and worth in the world so that the "walls of hostility" could be dismantled in the formation of new and revolutionary social arrangements. Grace wasn't an abstract metaphysical theory of atonement. Grace wasn't an internal psychological experience of guilt and gratitude to prompt an altar call. Grace was a social revolution. So when we talk about the covenantal obligations of grace we aren't talking about merit and works-based righteousness--pietistic moral efforts trying to be a "good person" to pay back or say Thank You to God. No, for Paul grace was a sociological phenomenon. "New creation" for Paul was the church, the new humanity called out of the world where there was neither Jew nor Greek, slave nor free, male or female. In short, grace for Paul was a lived, social reality. Therefore, to experience and participate in grace was to create and participate in this new social reality. Extra Ecclesiam nulla salus. There is no salvation outside the church. This was true for Paul. The reconciled new humanity of the church simply was salvation. The incongruous grace of God--poured out upon Jew and Greek, slave and free, male and female--formed this new humanity, began this new creation. To fracture this humanity is to step out of the church and back into the world, to step out of life and back into death. This is the covenantal obligation of grace, to participate in God's grace by living reconciled in Christ as the new creation. Thus it is impossible to say you are living in God's grace if you don't love your brothers and sisters. Ecclesiology is soteriology. The good news is first and foremost the act of God-in-Christ, but if it is not enacted in the social practice of believers, it ceases to be existentially real. [C]ommunal practice is integral to the expression of the good news.